Trade Show Exhibit Display – How to Attract Traffic and Impress! To be effective, the visual impact of your exhibit must make a strong first impression and communicate your message and benefits in a matter of seconds. This small window of time is critical to driving traffic and maximizing sales opportunities, as competitors at nearby locations aggressively work to attract the same potential buyers. Identify your display needs by answering the following questions. What do you want to accomplish through event participation and what are your specific objectives that will define success? How many events will you participate in annually? Do they attract national, regional or local audiences? 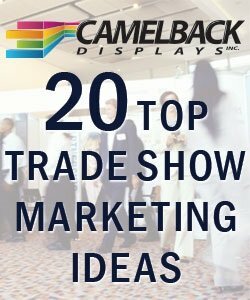 Do you need one or more trade show displays to satisfy your exhibiting needs at different events? What type of image and marketing messages do you need to communicate with your display? What location type (in-line, corner, end, island) and size of space will you require for your exhibit? How will you transport your exhibit to each show? Will you require a company that specializes in trade show freight services or will you be shipping and storing the exhibit yourself? How much is allocated in your trade show budget for your display needs to ensure you can meet your exhibiting requirements? Your exhibit, along with lighting and accessories can range from a few thousand dollars to more than $50,000+ for a top-end customized display. Truss Displays: Made of lightweight aluminum and steel tubing for a modern, high-tech look and flexible utilization. Truss can be configured in a variety of shapes and sizes - and can be used to construct entire booths, special exhibit features, display walls, islands, entrance ways, and more. Table-Top Displays: Offer a less-expensive exhibiting option for smaller events and feature a lightweight display that sits on top of a table. These displays usually have three panels with velcro-attached graphics and headlines that can be easily changed and updated. Exhibitors should use brightly colored table covers with logo and/or graphics to add impact to a table-top display. In an exhibition hall, booth areas for displays are created with backdrop drapery, which is typically provided by the venue or event sponsor. However, these pipe and drape systems are quite flexible and many companies use them for other purposes, such as a divider for a large meeting room or attractive background for a speaker. A number of trade show exhibit companies also rent displays to companies interested in testing different types and sizes of exhibits before moving forward with a purchase. Exhibit rental is also a cost-effective option for organizations that exhibit only once or twice a year. Click here for more about trade show display rentals. Be sure graphics and banners with your company or product name are highly visible, well-lit, and features large easy-to-read type. You may want to have multiple signs in different areas of your booth. Keep your message succinct and direct. After all, you only have about three seconds to make an impression and turn a prospect into a viable lead. 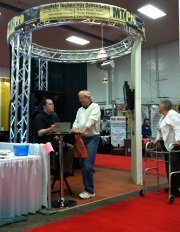 Why Rent a Tradeshow Booth?